One aspect of preparing men to become permanent deacons is introducing them to the concept of diaconal spirituality. At its core, spirituality is our road map for growing in friendship with Christ. The goal is holiness, or union with God. It’s called spirituality, because it involves aligning our spiritual faculties (mind and will) with what God desires for our ultimate happiness. What they’re saying is that they want a relationship with God, but consider religious institutions outdated and unnecessary. However, Christ did establish a church on the foundation of the apostles. He is the bridegroom and the church is his bride. It is futile to seek union with Christ while at the same time rejecting the church that connects us to his mystical body. In some sense, all baptized Catholics share the same spirituality, or road map to God. It’s called the “universal call to holiness.” All of us follow this path when, for example, we pray, receive the sacraments and support the church’s work of evangelization. However, deacons, through the sacrament of holy orders have taken on a more refined path: a path of service. Of course, the spirituality of service is the spirituality of the whole church and not just deacons. Yet, the deacon receives the special grace to bring to life the service dimension of Christ’s ministry. The deacon lives as one with a foot in two worlds. He has one foot in the secular world. So, in that respect, his spirituality resembles that of the laity. He also has one foot in the world of the institutional church. So, in that respect, his spirituality resembles that of the clergy, especially as he prays the Liturgy of the Hours with and for the entire church. From his vantage point in the midst of the world, the deacon is uniquely poised to identify the needs of the community. As an ordained minister and the living image of Christ the servant, he is then able to marshal the church’s spiritual and material resources to bring the healing balm of Christ’s love to those who are hurting. 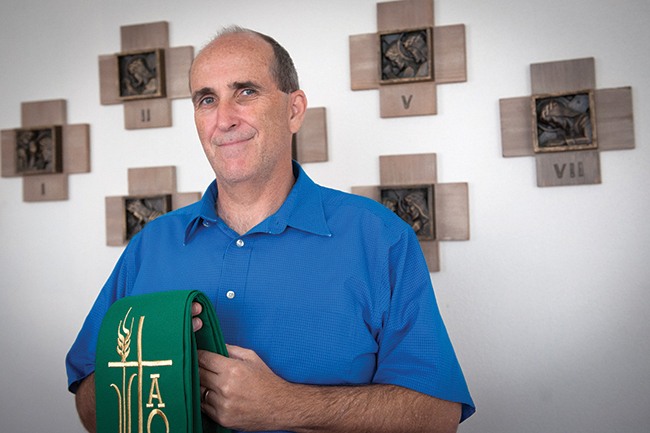 The deacon’s ministry of service stands in stark contrast to those who would go it alone, who seek spirituality without connection to the church. The deacon finds his way to union with God by making himself the servant of all, especially the poor. His spiritual practices will always be geared toward acquiring those virtues and attitudes that enable him to most resemble Christ, “who came not to be served, but to serve, and to give his life as a ransom for many” (Mk 10:45). Those interested in discerning a possible vocation to the permanent diaconate should complete the “Interested in the Diaconate?” form found online at: www.archkck.org/deacons. Leon, I hope you get this. This is Bill Alexander in Ventura and we have not corresponded for some time. I would like to get in contact with you again. Are you still in Olathe or have you moved somewhere else? I have a new email address, somewhat similar as below. Hope you and Maureen and the family are well.